Our visit to Vietnam would not have been complete without a trip to the demilitarized zone, or DMZ. This strip of land, which is approximately two miles wide, divided North and South Vietnam before and during the Vietnam War (or, as it’s called here, “the American War” or, depending on the speaker, “the War of American Imperialism” or similar). It thus separated Ho Chi Minh’s Viet Cong (VC) in the north from the American and South Vietnamese forces down south. Nearly every American of our generation has friends and loved ones whose lives the war changed forever. Our uncles and our fathers served there (as did a few thousand women), and we’ve seen its lasting impact on them. We’ve grown up watching movies about the battles waged from 1963 to 1973 and hearing stories about the discord the war prompted back at home. While Derek, Alyssa and I knew the basic outline of what took place during those troubled years, there was nothing like a field trip to the actual war zone to make it all hit home. At 6:00 a.m. one morning, we boarded a bus full of tourists (some American, some non-) and set off for the DMZ, not really knowing what to expect. At the end of the day, we had not only seen the sights, we had learned an important lesson about how cultural perceptions can influence the retelling of history. Our pint-sized guide (he maybe came up to Derek’s elbow) had a father who fought for the North and uncles who enlisted for the South. Like his American counterparts, he had grown up in the shadow of the war, only–given his geographic location—much more so. Born and raised in post-war Vietnam, he saw on a daily basis the physical destruction that the war caused, and he told us that his father died from the effects of Agent Orange. Needless to say, playing witness to the war’s devastation left him less than impartial: many of the facts he recited to us contrasted sharply with those in our Australian-written guidebook, and he peppered his spiel with adjectives that made the Americans on board bristle a bit. 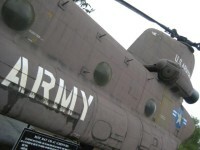 For me, one of the most interesting parts of the tour was the time we spent at the Khe Sanh Combat Base. Americans of our parents’ generation will remember Khe Sanh as the marine stronghold that President Johnson, in 1968, feared would soon be the site of a massive Viet Cong siege. The media took up the cry; Newsweek and Life both did cover stories on the impending attack. Huge supplies of planes, troops and ammunition were amassed to ward off the threat from the North, but it never really materialized as planned (the siege was much smaller than expected). Many scholars now believe that the VC threatened to attack Khe Sanh in order to distract US forces while the VC readied itself to launch the now-famous Tet Offensive. As it turned out, the comprehensive attacks that the North launched during the Tet holiday that year severely wounded the US and its allies and, according to many, mobilized American public opinion against the war. 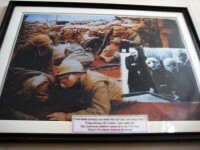 Khe Sanh now plays home to a small museum that prominently features pictures of Vietnamese soldiers doing various activities that, according to the captions, “Caused the Americans to flee in panic.” The comments in the museum’s guestbook were at once intriguing and heartbreaking. 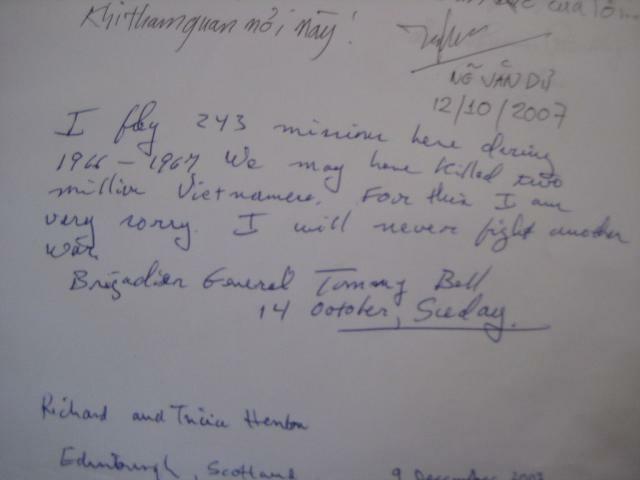 In addition to the usual “Peace Now” and “Down with the American Imperialists” messages were words from widows of American soldiers, from a mother whose son had been killed at Khe Sanh and from a U.S. Brigadier General named Tommy Bell: “I fly 243 missions here during 1966-1967. We may have killed two million Vietnamese. For this I am very sorry. 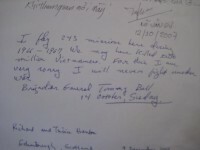 I will never fight another war.” Those comments will stay with me far longer than anything I might have read in a history book. After brief stops at the Rockpile and Dakrong Bridge, our bus pulled up to the Vinh Moc tunnels–almost 2 miles of underground passageways in which North Vietnamese women and children lived during the war, largely protected from the bombs that rained above their heads. 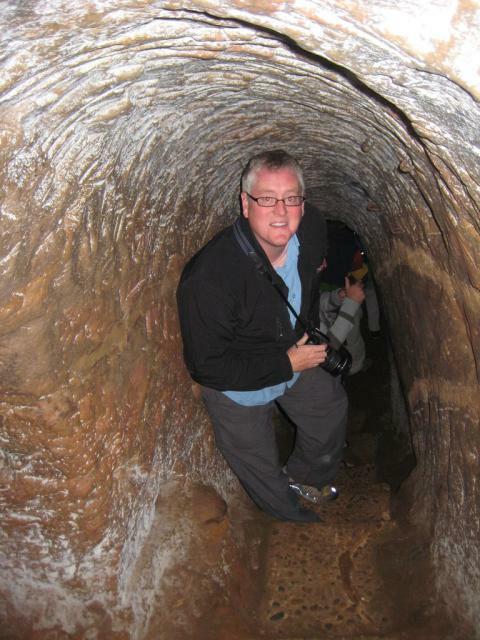 Not a place for claustrophobics, the dark tunnels are about five and one-half feet tall and maybe three feet wide. They form a sort of warren, complete with meeting rooms, living areas and a maternity ward where 17 babies were delivered during the war years, only to spend the first years of their lives entirely underground. All in all, our day in the DMZ allowed me to glimpse the vast differences between American and Vietnamese perceptions of the war. Particularly given the debates over our country’s current involvements on foreign soil, it also afforded me a timely and much-needed history lesson. Now it’s time to hit the books in search of answers to the many questions raised by our time in a place where so many soldiers–American and Vietnamese alike–gave their lives in service to their country.